Steven Universe is back, baby! Here’s what’s up in the world of TV for Thursday, May 12. All times are Eastern. Steven Universe (Cartoon Network, 7 p.m.): Due to its rather eccentric schedule, Steven Universe fans have learned to cope with long periods of downtime between episodes. 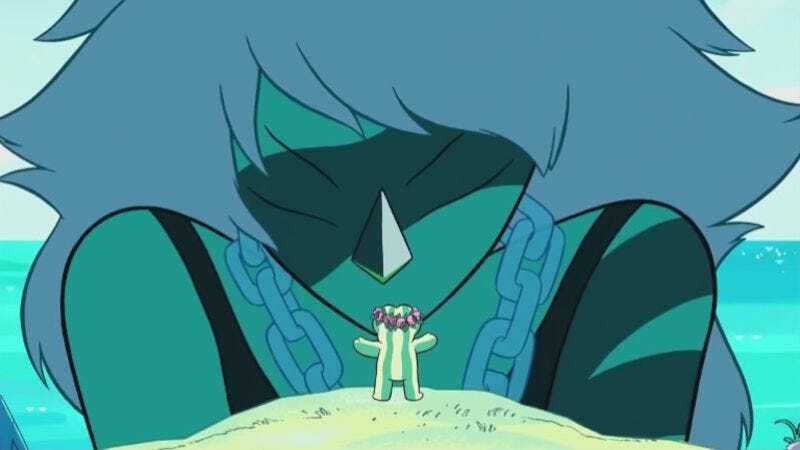 But as Shakespeare once wrote, “Parting is such sweet sorrow that it only makes it even more exciting when Steven Universe finally returns.” Or something like that. The important thing is that Steven Universe is back for a four-week event dubbed “In Too Deep.” That means four Thursdays of new Steven adventures, including the back-to-back episodes in tonight’s premiere. This run of new episodes looks like it will finally deal with the Cluster head-on, and Eric Thurm is so excited he just might fuse. The 100 (The CW, 9 p.m.): It’s the first half of The 100’s two-part season finale. Clarke finds hope in an “unlikely place” while A.L.I.E. launches her master plan and Roan returns to form an uneasy alliance. After this brutal season, Kyle Fowle is currently taking bets on which beloved character(s) will be offed as season three comes to an end. Orphan Black (BBC America, 10 p.m.): Orphan Black reaches the halfway point of season four and to celebrate, Krystal returns! The debut of the blonde manicurist was one of the best parts of season three, and Lisa Weidenfeld has high hopes for her reappearance tonight. Elsewhere, Cosima teams up with Donnie to do some investigating and Sarah tries to discredit Felix’s new ties. Scandal (ABC, 9 p.m.): After a rocky year, Scandal reaches its fifth-season finale. The presidential candidates select running mates, Olivia finds herself in an “alarming situation,” and Cyrus comes across information that could “upend” the election. The promo promises lots of twists and turns, but Gwen Ihnat would settle for a halfway-decent episode to analyze in her final Scandal review. The Big Bang Theory (CBS, 8 p.m.): In honor of its own season finale, The Big Bang Theory offers up a whole bunch of parents. Judd Hirsch makes his first appearance as Leonard’s dad, while Laurie Metcalf and Christine Baranski return as Sheldon and Leonard’s respective moms. Kyle Fowle hopes Baranski winds up slapping someone in the face just to establish that as her new thing in season/series finales. Battlestar Galactica (11 a.m.): After easing back into Battlestar reviews last week, Zack Handlen tackles the iconic two-parter, “Resurrection Ship.” Admiral Helena Cain and Commander Adama reach an uneasy standoff while secretly trying to decide whether to assassinate one another. Also, someone gets a promotion and someone else gets kissed. Bob’s Burgers, “Topsy” (Netflix): Much like Steven Universe, Bob’s Burgers perfectly blends goofy animation with real heart. For instance, in “Topsy,” Louise, Tina, and Gene explore the dark history of Thomas Edison and his elephant Topsy—through song!